The 2017 winner of the AMBR Award was this 1936 Packard Roadster built by the team at Hollywood Hot Rods. The Grand National Roadster Show took place in Pomona, Ca last weekend and it attracted 1,000s of classic car enthusiasts to Southern California. This annual event is now in its 68th year and didn't show any signs of slowing down. 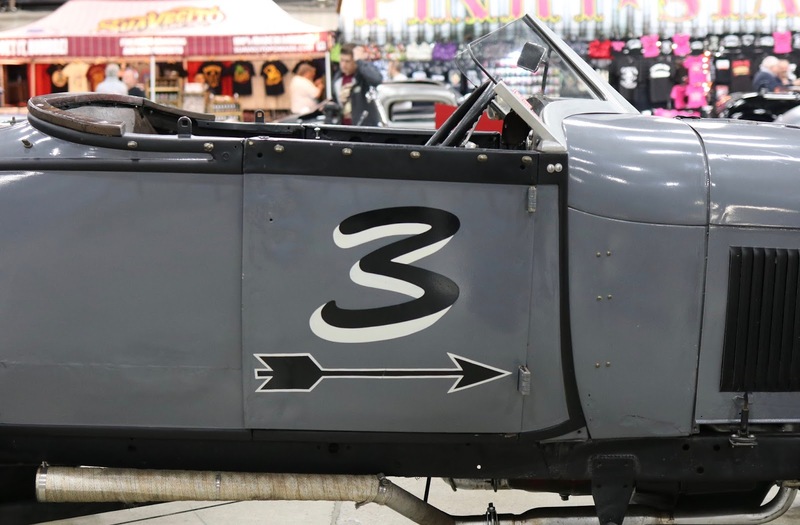 The Pomona Fairplex was packed on Saturday with enthusiasts who couldn't wait to see the contenders for the America'a Most Beautiful Roadster Award. The California Car Cover Crew was on hand all weekend talking car care and of course, taking photos of the incredible vehicles on display. A few more of the competitors for the AMBR Trophy are shown above. A killer roadster pickup from Goolsby Customs and a signature Rick Dore coachbuilt roadster. 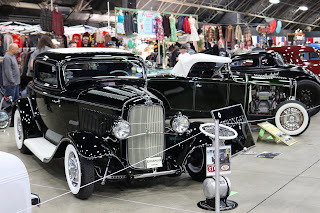 Our friends from Brizio Street Rods always bring some cool hot rods to the Grand National Roadster Show. The Suede Palace is home to some of the finest traditional rods and customs at the event. Here are some photos of just a few of them. 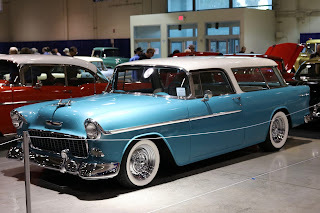 One of the most popular exhibits at the show was the Tr-Five building to celebrate 60 years of the 1957 Chevrolet. If you love the 1955-57 bowties, this was the place to be. 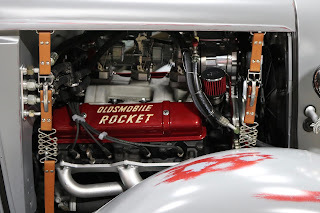 Plenty of vintage race cars and dragsters were on display too. Custom paint on a few Chevy lowriders in another building. Our friends at SIC Chops brought our their custom Suburban that was turning heads at SEMA back in November. In building 4 were all the contenders for the AMBR Trophy. 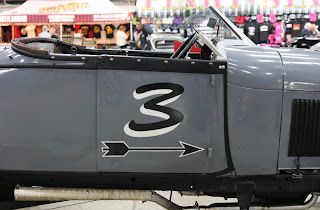 The builders all took different approaches to their roadsters and it shows here. All the roadsters were incrediblly detailed and well built. 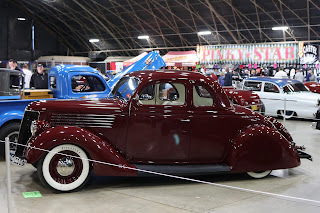 Thank you to everyone that stopped by the California Car Cover booth over the weekend. We had a great weekend at the Fairplex and we will see you back there in 2018! 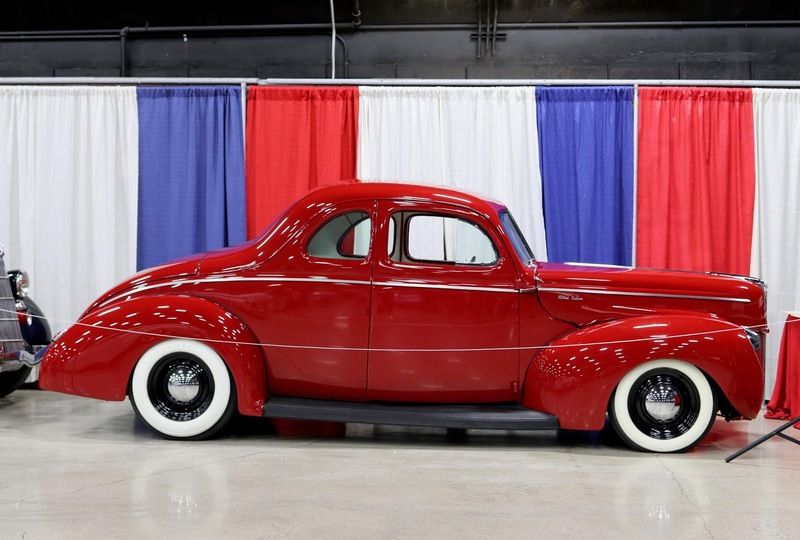 Our 2017 car show schedule for California Car Cover is here. Each year we try to bring our local friends and customers unique ways to get together and grow the classic car community. This year we have some new events to get more people an opportunity to meet and hang out with us at our headquarters in Chatsworth, Ca. For the past few years, we have had specific car shows on a handful of Saturdays at our store. We've had classic Ford days, muscle car day or Camaro day to name a few. Instead of those marquee days of the past, this year we will host Saturday Socials. These will be casual "Cars & Coffee" type get-togethers on select Saturdays this spring-fall. The free events will be low key social hours to meet with like minded men and women who are passionate about their cars, no matter what they drive. The events are open to all makes and models of new or classic cars. We will host coffee and donuts in the morning, plus see what type of special cars or guests we can get to show up for each social. More details on each event will be posted to the California Car Cover Facebook page. The largest event we host each year has become the annual European car show. 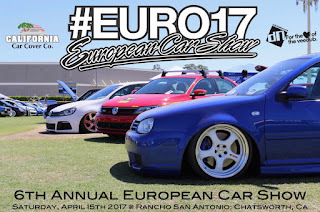 This event attracts late model European cars from all over California to Rancho San Antonio in Chatsworth, Ca. We host this event along with Bernie Chacon, of dubNation Events. Last year, we had over 600 cars in attendance and look to make the event bigger and better in 2017. EURO17, as it is called, is a charity fundraiser for our friends at Rancho San Antonio, a nonprofit group, around the corner from California Car Cover. Complete details about this event will be posted to eurocarshow.us. 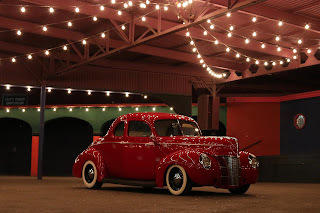 Wednesday, August 16th will be our 6th Annual Summer Cruise Night. 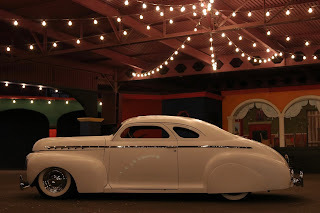 When the suns goes down, cruise over to California Car Cover for our yearly parking lot party. The free show is open to all makes and models of custom cars. We always have a live band and local vendors. 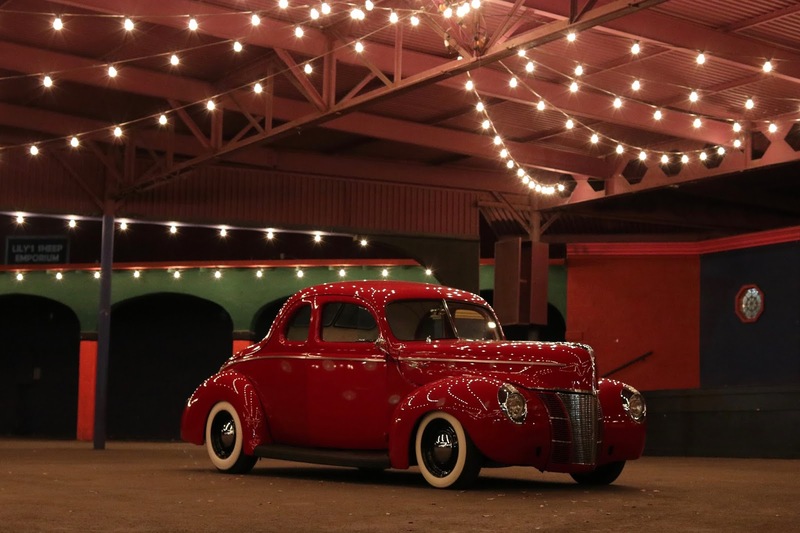 Last year, we packed the house, so expect a good time with friends, classic cars and rock n roll. The last Saturday Social of 2017 will coincide with our 9th Annual Parking Lot Sale. Each year, we empty the warehouse to make room for seasonal and holiday merchandise. It's a great chance to save money of open box, old stock and closeout merchandise. Mark your calendars if you need to stock up on car covers and garage items. Always a local customer favorite! Our January 2017 California Car Cover featured a high performance Ford Mustang Shelby GT350. This modern muscle car is at home on the freeway or racetrack with its blend of performance, style and comfort. Our friend Paul Alhasian of PK Auto Design brought over his 2016 Ford Shelby GT350 for our new year's photo shoot to feature some new custom accessories from California Car Cover now available for the GT350. 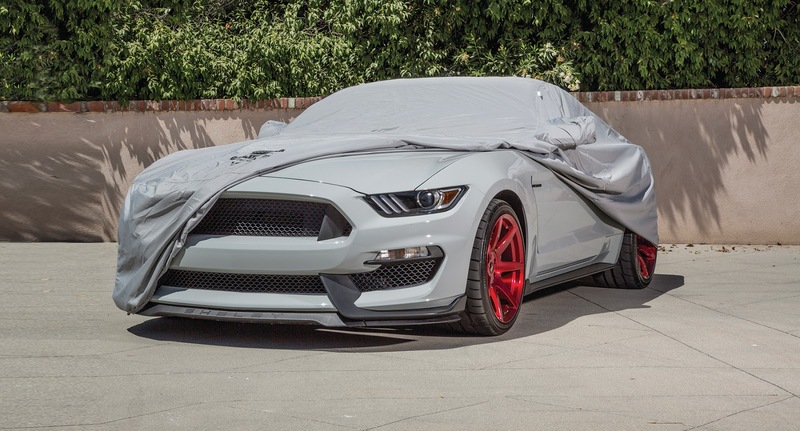 One of our Superweave all weather outdoor car covers is the ideal cover for a GT350 looking to take the cover with him or her to work, the track or a weekend trip. The compact size of the Superweave cover does not affect its performance. The lightweight material is highly water resistant and excellent against dust and UV rays. Paul and the team at PK Auto Design are known for their custom wheel designs. His GT350 rides on a set of wheels he designed with a eye catching red finish. Lloyd Mats has been making custom fit floor mats for California Car Cover since our beginning. 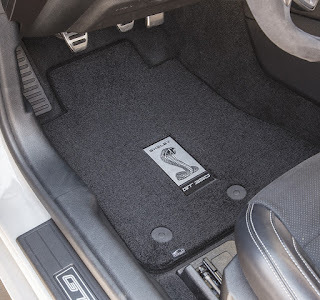 Their premium quality floor mats are second to none. 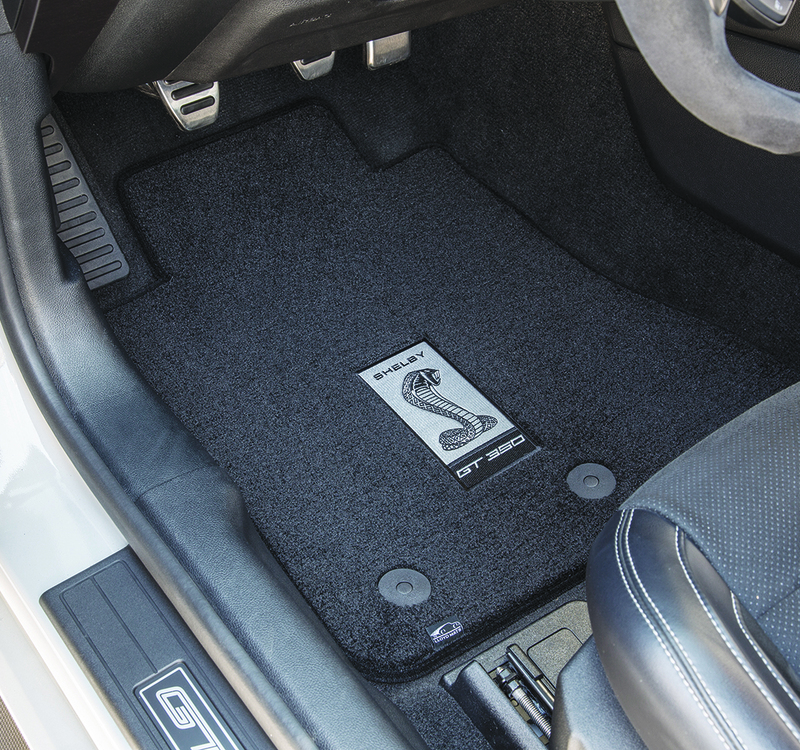 For the 2016 Ford Mustang Shelby GT350 we selected a set of Ultimat carpet floor mats with the Shelby logo appliques. The mats feature the licensed logos and factory matching mat securing tabs. 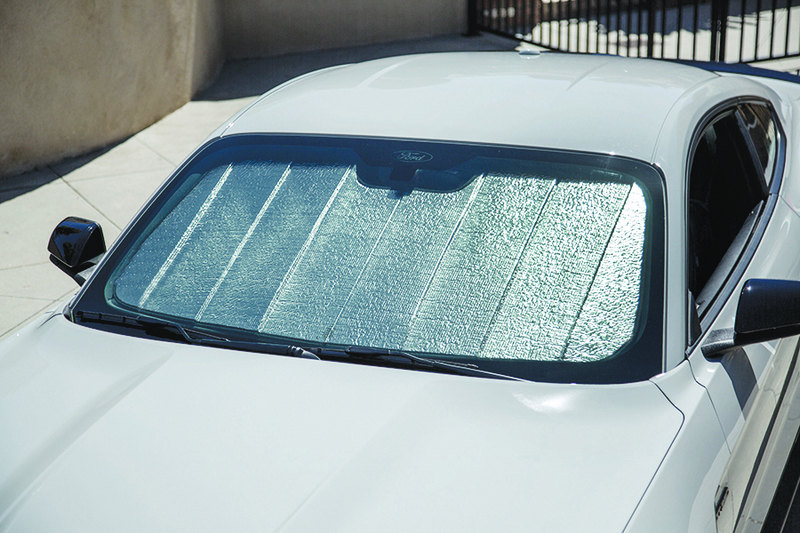 To keep the heat out, we selected an Ultimate Reflector Sun Shade by Intro-Tech. 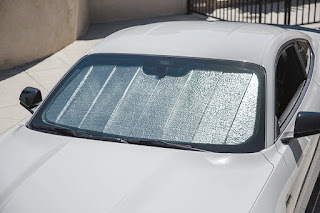 The Ultimate Reflector's insulated panels and reflective film reduce heat to keep the interior much cooler. The Ultimate Reflectors are custom fit to specific year, make and model of the vehicle. 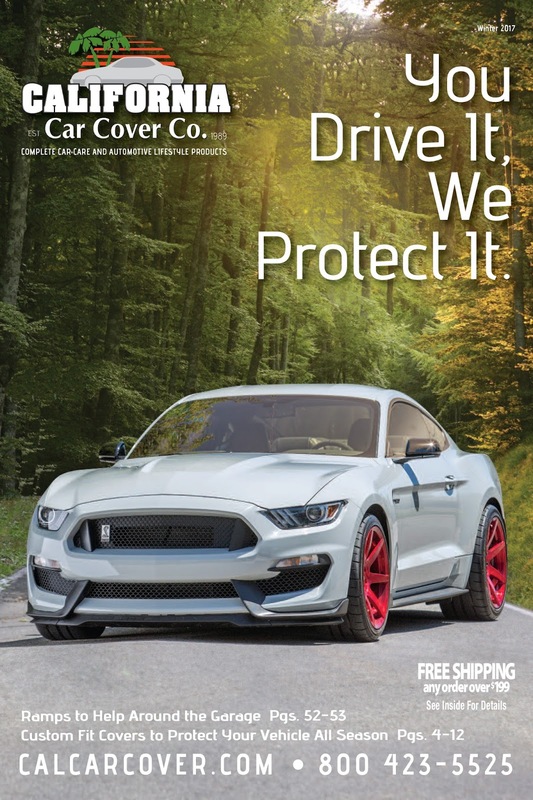 Here is the 2017 California Car Cover January catalog cover if you haven't seen it in your mailbox. You can always view the e-version on our website or request a catalog over the phone.